Will Hannah have an asthma attack today? Is Jacob’s burn healing or is the scar just going to get worse and worse? Am I doing a good enough job teaching Adam at home for kindergarten? Did their teeth get brushed enough or are they getting cavities? My list of worries could go on and on…. My favorite part of the book explores being “In the Moment With Your Kids.” Ironically, I was reading this book when my son asked me to look at what he had drawn during his art class. My son is always asking me to look at something he has made so I was a bit frustrated and said, “Adam, please leave me alone for a bit while I am reading my book.” In that moment, our eyes locked and I noticed his silent tears as he started to walk away quietly. I stopped him, put my book down and said, “Honey, come sit with me and let me see what you made.” He got the biggest smile and raced over to show me a picture he had drawn of his family, complete with him holding hands with me inside a heart. I got it! I really got it….being in the moment with your child is priceless and more valuable than anything. I consciously make time everyday to just take a few minutes and devote it solely to my children. Do you know someone who is about to become a mother or who worries about life (like me)? This book would make an excellent gift idea and I can’t recommend it enough. I can’t say that I will ever completely stop worrying about my children but there were several lessons that I learned from this How To Be a Zen Mama that will stay with me and impact me in my daily life. Excuse me…I think I am going to sign off from this review and go laugh with my kids for a bit! 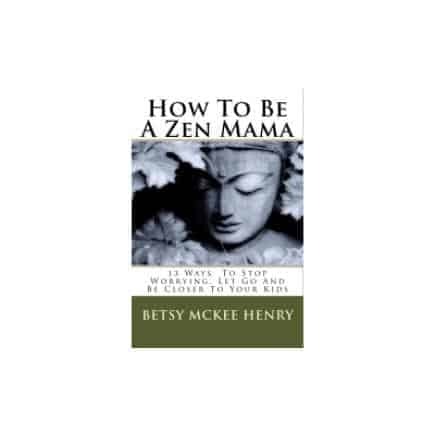 Thanks, Maureen, for such a wonderful review for How To Be A Zen Mama. Tell your readers that I’ll sign each book for them if they order from your Simply Stacie Open Sky Store. I have the book and LOVE it! GREAT words of wisdom! Oh, forgot to mention that your “in the moment” story is so sweet! Holding hands inside a heart… too sweet! Makes me wonder how many times do we miss those sweet moments being busy or in a hurry?